More recently, astronomers claim to have found the black spot or more often called dark vortex at the Neptune. According to experts, the black vortex is a high pressure system, which is usually accompanied by a cloud 'companion', high above the planet's surface. 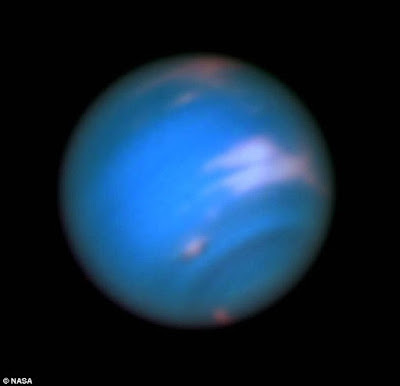 A new picture of the appearance is obtained on May 16, 2016, by the Hubble Space Telescope, to confirm the existence of the dark vortex in the atmosphere of Neptune. According to a report quoted by the Daily Mail on Friday, June 24, 2016, even though the same features seen ever found during the Voyager 2 trip that crosses Neptune in 1994, the discovery of 'dark vortex' is the first in the 21st century. The discovery was announced on May 17, 2016 at the Central Bureau for Astronomical Telegrams (CBAT) by Mike Wong, an astronomer from the University of California, Berkeley. 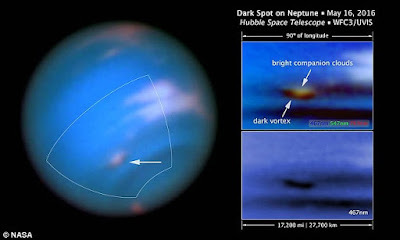 Mike analyzing data from Hubble found that the dark vortex of Neptune is a high-pressure system that is usually accompanied by a cloud of light and can be seen from outside the planet. The bright cloud is formed when the flow is circling in the sky above distracted and diverted to the dark vortex, causing freezing into ice crystals of methane gas. "The dark vortex spread through the atmosphere like a mountain of gas lenses are great. And the cloud 'companion' which is similar to orogafis clouds appear, (pancake) shaped bending mountains circling the Earth," said Mike. Started in July 2015, a bright cloud again seen in Neptune by some observers, ranging from amateur observers to astronomers at the W.M. Keck Observatory in Hawaii. Astronomers suspect that the cloud is a cloud of light that surrounds the black vortex. Interestingly, the dark vortex of Neptune is only seen along the blue waves, and only Hubble has a high resolution to be able to see the phenomenon. In September 2015, an annual project of Hubble, Outer Planet Atmosphere Legacy (OPAL), that captures the global map outer planet. And the map reveals a dark location, situated near the bright cloud. The data obtained from the Hubble, allowing researchers to create a map with high quality, from the dark vortex and its surroundings. The dark vortex of Neptune provides many 'surprises' during the last few years. Starting from the shape, size, and stability - which sometimes crosswise and tortuous. The vortex also appears in a shorter period of time, compared with the similar anticyclones are seen in Jupiter. The planetary astronomers hope to get a 'bright light' of how the black vortex is formed, originates, and how the vortex interacts with the environment.